Milk chocolate is sweet chocolate that also contains milk powder or condensed milk. In the UK and Ireland, milk chocolate must contain a minimum of 20% total dry cocoa solids; in the rest of the European Union, the minimum is 25%. “White chocolate” contains cocoa butter, sugar, and milk, but no cocoa solids. Chocolate contains alkaloids such as theobromine and phenethylamine, which have physiological effects in humans, but the presence of theobromine renders it toxic to some animals, such as dogs and cats. Chocolate contains “brain cannabinoids” such as anandamide, N-oleoylethanolamine and N-linoleoylethanolamine. White chocolate, although similar in texture to that of milk and dark chocolate, does not contain any cocoa solids. 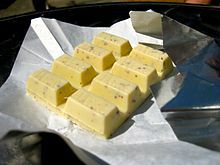 Because of this, many countries do not consider white chocolate as chocolate at all. Dark chocolate is produced by adding fat and sugar to the cacao mixture. The U.S. Food and Drug Administration calls this “sweet chocolate”, and requires a 15% concentration of chocolate liquor. European rules specify a minimum of 35% cocoa solids. A higher amount of cocoa solids indicates more bitterness. Semisweet chocolate is a dark chocolate with a low sugar content. Bittersweet chocolate is chocolate liquor to which some sugar (typically a third), more cocoa butter and vanilla are added. It has less sugar and more liquor than semisweet chocolate, but the two are interchangeable in baking. It is also known to last for two years if stored properly. As of 2017, there is no high-quality evidence that dark chocolate affects blood pressure significantly or provides other health benefits.